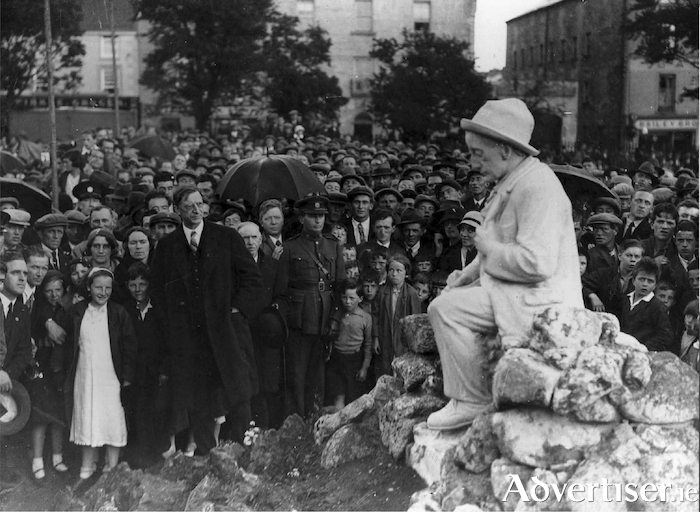 President Éamon de Valera and a large crowd at the unveiling of the Pádraic Ó Conaire’s statue at Eyre Square June 9 1935, nineteen years after the Easter Rising. He had admired his class mate’s wicked sense of humour and his romantic observations of rural people, written in a modern Irish style. The ceremony was conducted as Gaeilge, and nationally broadcast on radio. The statue became Galway’s best-loved and the most photographed landmark. . The Dunkellin monument was erected in the year 1873, and subscribed for by the Clanricarde tenantry, a good deal of which, it was stated, was obtained from the people by threats. When the statue disappeared, the pedestal was mounted by Big Jim Larkin, co founder of the Labour Party and the Transport and General Worker’s Union, and others including Mr P Kiley, secretary Galway Tenants Association. Earlier that day Larkin, a powerful leader and orator, had lambasted the Urban Council on its poor housing record. Larkin claimed there were 375 houses in town certified by a doctor as unfit for human habitation. The town had sewerage running into the main water pipe. He demanded to see the schemes of the new houses which the council said were drafted. The council refused to show him. Larkin hit back accusing the members of landlordism, and warned that the tenants of Galway were now out to abolish all landlords, and would not stop till every tenant was the owner of the roof over his head. Thirteen years later the plinth still remained at the top of Eyre Square. It was suggested that the Ó Conaire statue should be placed on top. But at a meeting of the Urban Council, two of the original proposers for the monument, Professor Liam Ó Briain and T O Conceanian, strongly objected to any association with the Clanricardes. Albert Power, the sculptor, also refused to allow his statue there. Cllr Mary Ashe, an influential voice on the restored Urban Council, scotched any association between Ó Conaire and the Clanricardes. She remarked that the remains of the Dunkillen statue ‘was neither useful nor ornamental’. It was removed. The site was replaced by Albert Power’s artistically carved likeness of Sean Pádraic, sitting on a stone wall, in a rural setting… writing. Birds and a rabbit play at his feet, charmingly conveying not only the man, but the amusement within his personality. Curiously, although Ó Conaire was born one of five children, over a public house at New Docks, Galway, on October 6 1882, to parents who spoke Irish,**** he grew up an English speaker. That knowledge of English helped him later to secure employment as an assistant clerk in the civil service in London. For 15 years he lived there with his partner, Mary McManus, and their three children, Eileen, Kathleen and Pádraic. Like many emigrants before him, and after, he joyfully discovered the Irish language, becoming involved in Conradh na Gaeilge, and with Michael Collins was a member of the Irish Volunteers No I London. But the day, much looked forward to by a proud town of its best known writer, could have been a disaster. On the evening before its unveiling, as the statue was wrapped and tied with rope, some trickster found a way under the canvas, and managed to fit on a large blue shirt over Sean Pádraic, sitting quietly, writing silently on a stone wall. The so called ‘Blueshirts’ *** were de Valera’s sworn enemy as they had supported the Anglo Irish Treaty, and in Dev’s eye were responsible for the cvil war. If the blue shirt had not been discovered before the unveiling, there would be two sides among the large crowd, who had come to watch the ceremony: One half madly grinning, the other half appalled at the slight to the President. In the event the shirt was discovered before the President arrived. It was immediately taken off by An Garda Síochána whoich remained on protective duty. A large crowd, estimated at approximately 3,000, attended the happy occasion, and welcomed the pPreport that his one time partner of 15 years, Mary McManus, was there. Next week : The accusation by Fr Peadar Ó Laoghaire, writer, that Ó Conaire’s work dealt with adultery, prostitution and alcoholism! A bad mark against any writer in the early decades of the 20th century. Notes: * The Waterford News June 7 1935. ** Lesa Ni Mhunghaile, Dictionary of Irish Biography. ***’The Blueshirts’ a Right wing movement within the Irish Free State in the early 1930s. It provided physical protection for political groups such as Cumann na nGaedheal from intimidation from the anti Treaty IRA. Most of the political parties, whose meetings the Blueshirts protected would merge into Fine Gael. **** His father Tomás Ó Conaire, publican, emigrated to America six years after Pádraic’s birth, and died either on the journey or shortly after his arrival. His mother, was Cáit (née ) Ní Dhonnacha. Thanks to Brendan McGowan for further information. A ‘cheerful, and amiable saint’. Page generated in 0.1393 seconds.